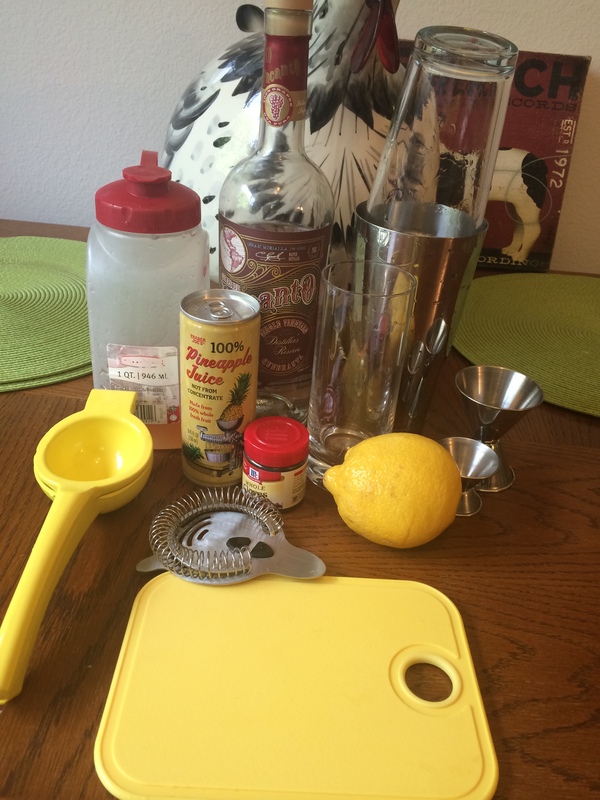 TBT Classic Cocktail #1: San Francisco Pisco Punch! Since Twitter officially took over the world with the institution of Throwback Thursday and since The Woman At The Bar is herself a slave to the internet meme zeitgeist, we have decided that our Throwback Thursday will be dedicated to a classic cocktail from the American past. We will work to bring you recipes for the best version of the staples, and introduce you to a few you may not be familiar with! To kick it off, we are heading back to San Francisco in the 1800s with the San Francisco Pisco Punch. Check it out! As we mentioned in our basics article about booze, pisco is one of The Woman At The Bar’s absolute favorite liquors. Not only that, but for a time it was the absolute favorite liquor of much of the American West! As a brief refresher: pisco is a type of brandy (which means that it is a liquor distilled from wine) originally produced in Peru. During the 1800s, traditional brandy (imported from Europe) was the elite drink of choice on the East Coast, but transporting the sweet nectar west over land proved difficult and expensive. Not to be denied a fancy drink of their own, the intrepid frontiersmen and women on the West Coast realized that those smarties down in Peru were making similar (and BETTER) stuff, so they loaded it onto boats and sent it straight up to the California ports. And thus, the West’s love for pisco was born! This drink, as you might be able to glean from its name, was invented in San Francisco, and for a time was the drink of choice throughout the city. It has been mostly forgotten in the last 100 years, and that my friends is a terrible, terrible shame. It is positively delightful, and The Woman At The Bar could not be more excited for you to try it! Gather all of your ingredients plus your shaker, traditional and mesh strainer (you WILL need both, don’t skip the mesh! 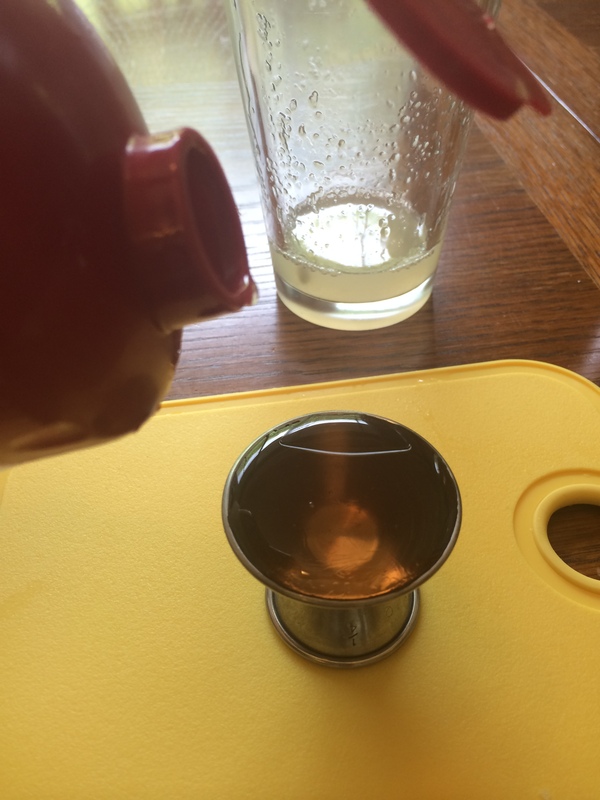 ), fruit press, and appropriately sized jiggers. Ready? Lets go! Actually, before we go, you will need to make your cinnamon simple syrup. It is very easy, but will take 15 minutes to cook, plus time to refrigerate and cool. Unlike traditional simple syrup, you will need to cook this one on the stove. 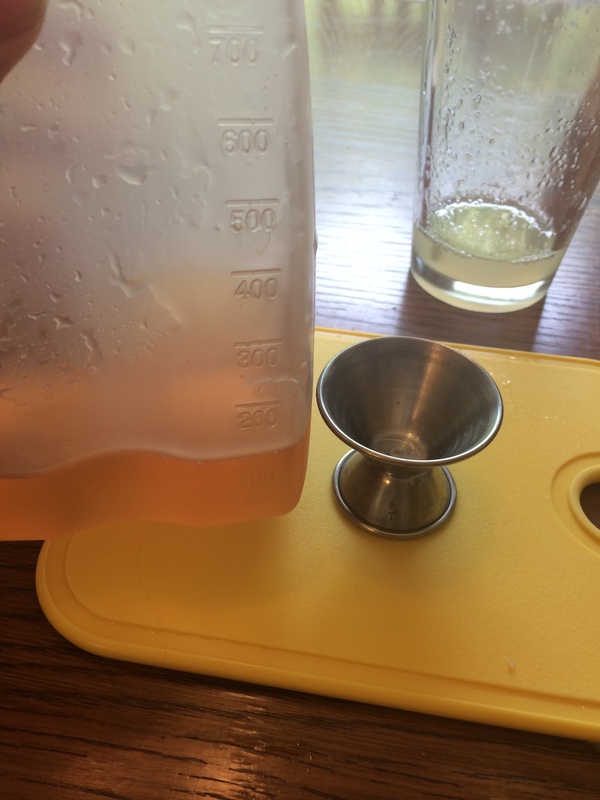 Take a 1:1 ratio of sugar and water (I usually stick with one cup of each) and combine them in a small saucepan. Turn the heat to medium-low and add 3-4 cinnamon sticks to the mixture. Simmer on low for 15 minutes, stirring occasionally. Let it cool a bit, then remove the cinnamon sticks, pour the syrup into an air-tight container, and shove that baby in the fridge to finish cooling. This will keep for two weeks. Okay, now that your syrup is ready to go, lets get that drink into your hands! 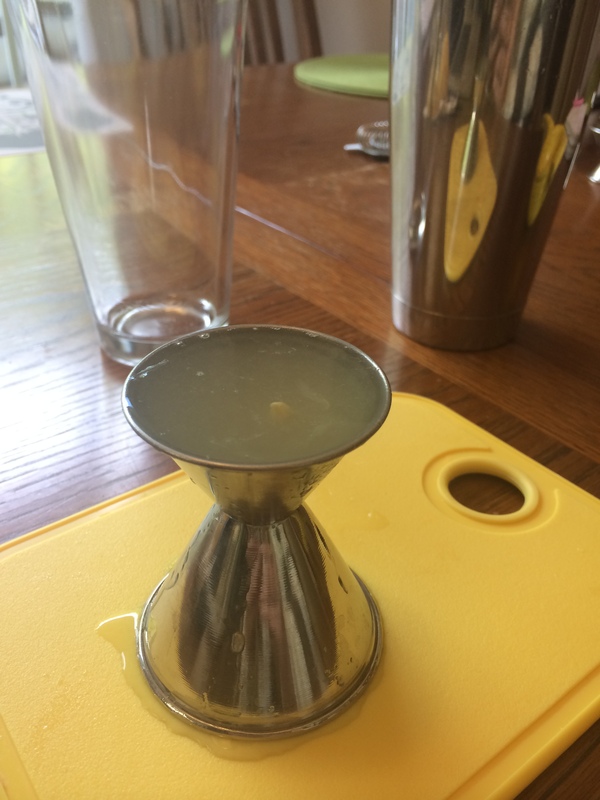 First off, squeeze your lemon juice (either into a small container, or directly into the 1 oz jigger), measure, and pour it into your shaker glass. Now do the same for the cinnamon syrup! 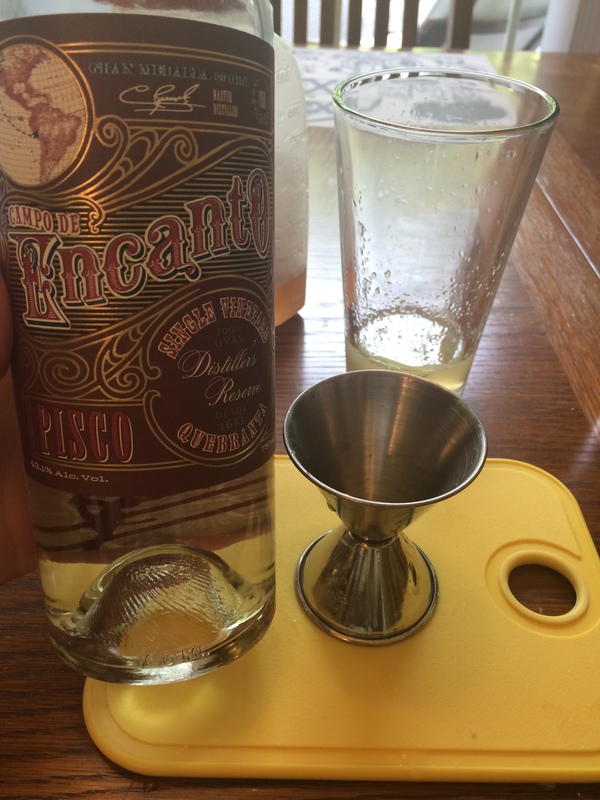 After you pour that deliciousness into your shaker glass, add in 2 ounces of pisco! 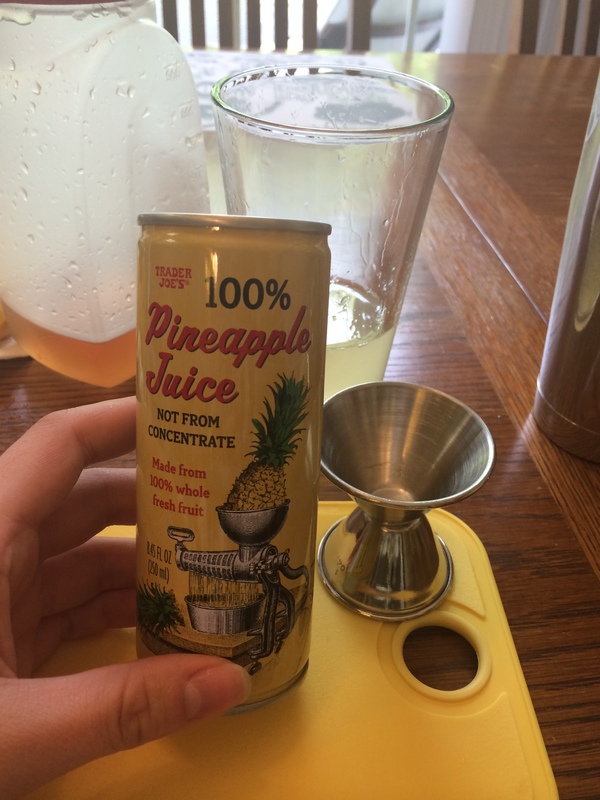 Now measure out 1 1/2 oz of pineapple juice, and add that into the shaker glass. A note on pineapple juice: this is the one and only time where The Woman At The Bar does NOT recommend making your own fresh juice straight from the fruit itself. Making pineapple juice is ridiculously hard and not worth it. We recommend a great canned pineapple juice from Trader Joes (pictured below). If you can’t get that, you can go for another canned variety, as long as it is 100% juice and not from concentrate (aka, not Dole). Last, but certainly not least, pour out 4 whole cloves and drop them straight into the mix! Now fill your shaker tin about 2/3rds full of ice, pour your drink mixture in, secure the shaker glass to the shaker tin, and shake shake shake vigorously for 20 seconds. Now, fill your serving glass with ice (you will want a tall collins glass for this, not a high ball), and prepare to strain this nectar of the gods. 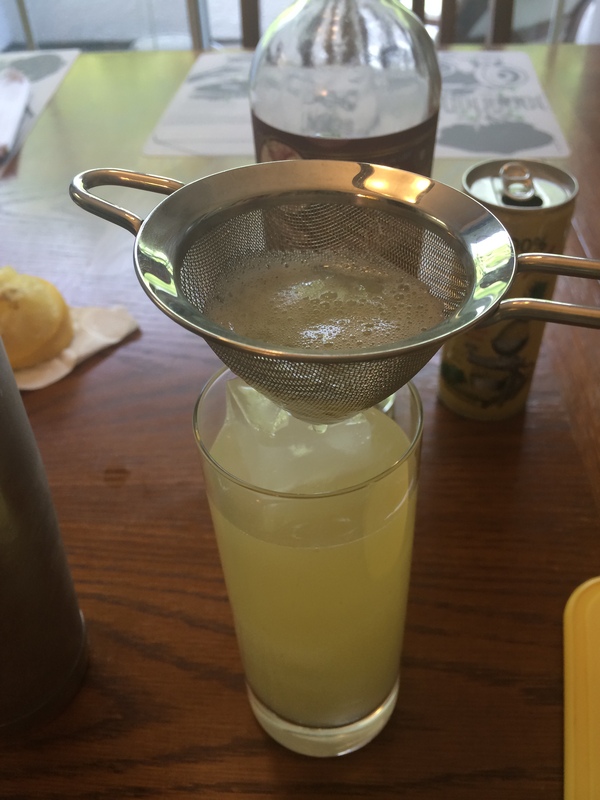 ATTENTION: this is the most important step: attach the traditional strainer to the shaker tin, and hold the mesh strainer directly over the serving glass with your other hand. Pour the drink directly into the mesh strainer. 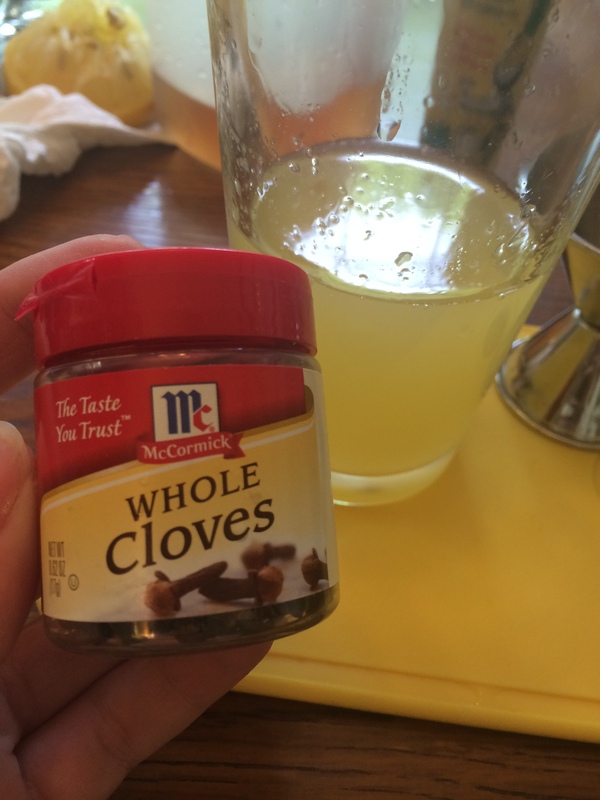 Remember those cloves we tossed into our mixture? 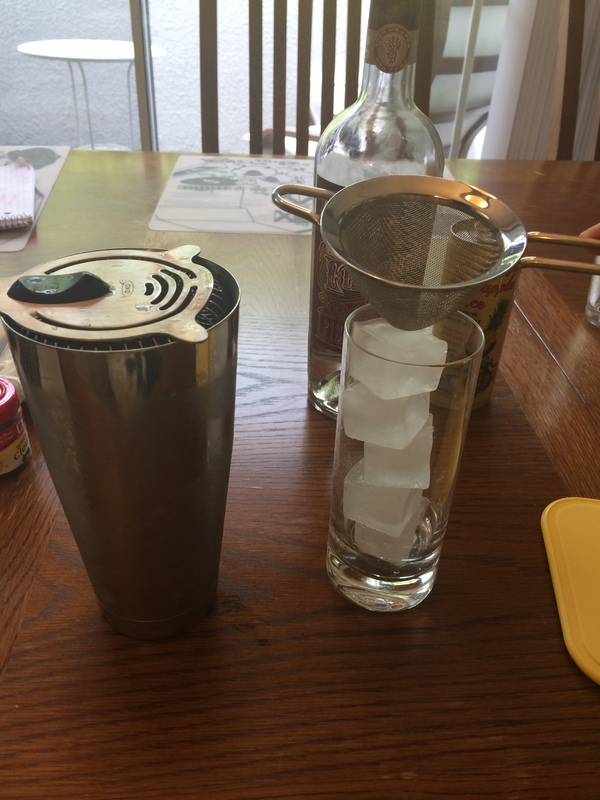 Those puppies broke up when we shook our drink, and you REALLY want to strain those pieces out — a traditional strainer will let them get through. We want the taste of the cloves in our drink, not gross pieces of dried spice. Yuck. You will probably notice that it takes the drink a hot second to strain through the mesh. Don’t worry, you are doing it right, just be patient. AND VOILA! You’ve got yourself a genuine Classic Cocktail! Sidebar straight from KellyAtTheBar: This is one of my all time favorite drinks. When I first read this recipe I thought, “cloves, cinnamon, and pineapple? Absolutely not.” But when I tried it I was blown away. I think you will be too! Happy Throwback Thursday, everyone! Sit back, relax, and imagine you are in San Francisco during The Gold Rush. 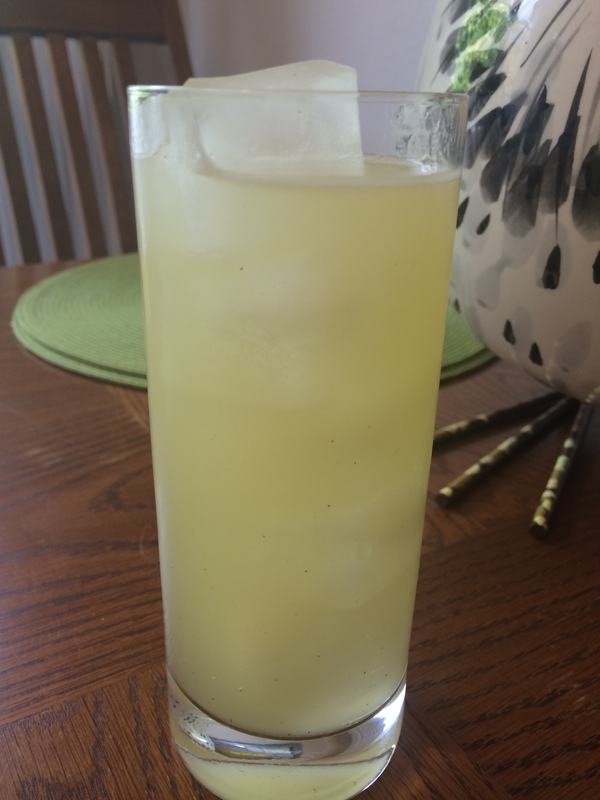 This entry was posted in Liquor, TBT Classic Cocktail and tagged cinnamon syrup, classic cocktail, pineapple juice, pisco, punch, tbt by kellyatthebar. Bookmark the permalink.